The date 12/12/12 wasn’t the most annoying date on Facebook, neither was the purported “end of the world” date, the most annoying day on Facebook, ladies and gentlemen, will be when the clock strikes 12am early tomorrow morning no thanks to Facebook’s Midnight Message Delivery on New Year’s Eve. Few days ago, Facebook added a new Facebook Stories feature that automatically sends out New Year greetins to all your friends at midnight tonight so that you are one of the first to do so. 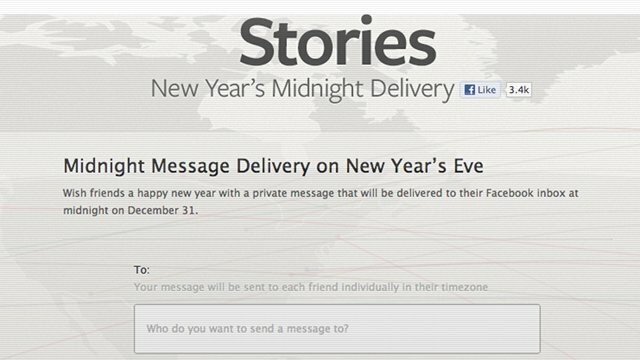 The feature, available at http://www.facebookstories.com/midnightdelivery (unavailable at the time of writing), allows you to predefine a message along with a list of recipients. You can customize and send different messages to different groups of people and when the clock strikes 00:00:00 on 1 January 2013, the message will be fired into their respective inboxes. Unfortunately though, the feature is reported to have a bug that allows others to view your messages and vice versa simply by keying in some fresh numbers into the URL. The site is down at the moment of writing, I suppose Facebook is fixing the issue right now. So, do you look forward to having your Facebook message being spammed with New Year greetings?